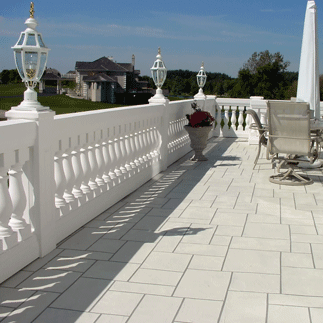 Royal Corinthian manufactures 3 structural balustrade systems made from composite materials that will last for generations. 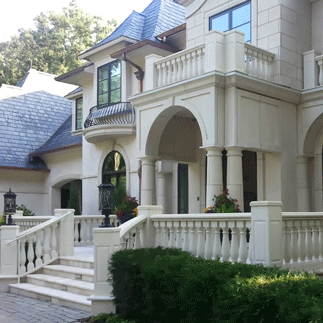 Our balustrades, which are comprised of balusters or spindles, top/bottom rails, newel posts and caps, decorative finials, and installation hardware, are available in RoyalCast™ composite fiberglass, RoyalStone™ polymer stone, and RoyalThane high density polyurethane. Each of our systems has been independently tested by engineering firms and exceeds commercial and residential building code requirements for a structural balustrade. All of our balustrade systems are lightweight systems when compared to natural stone but some are significantly lighter than others. 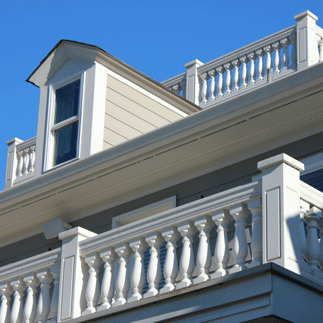 We are the only manufacturer that offers all 3 materials in the same styles so the same project can use our RoyalStone balustrades on the front porch and our lightweight polyurethane system on a rooftop that has weight restrictions. If you want to know more about each of the 3 materials, look at the comparison chart below. If you already know which product you are looking for, click on the appropriate product. System Widths Up to 10" Up to 10" Up to 12"
System Heights Up to 51" Up to 51" Up to 51"
*RoyalCast and RoyalStone Balustrade systems can be made half the normal weight while maintaining the same wall thickness using Prolite, a lightweight filler.